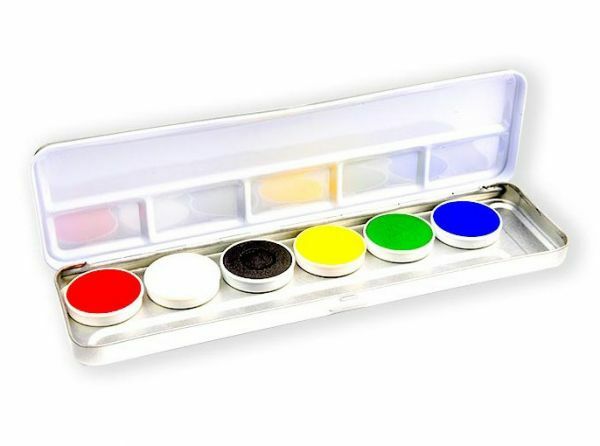 Product information "Aqua color Face Paint palette 6 colors superstar"
This make-up palette has 6 different colors: red, white, black, yellow, green and blue. Content: 2.5 grams per color. Luxury make-up palette with 6 colors make-up on water basis and therefore suitable for children without extra experience. The colors are easy to mix with each other, with a moistened make-up sponge or brush, mix the compact mass with a little water and apply as thinly and evenly as possible on the skin. The color dries matt and virtually does not matter. Related links to "Aqua color Face Paint palette 6 colors superstar"
Customer evaluation for "Aqua color Face Paint palette 6 colors superstar"